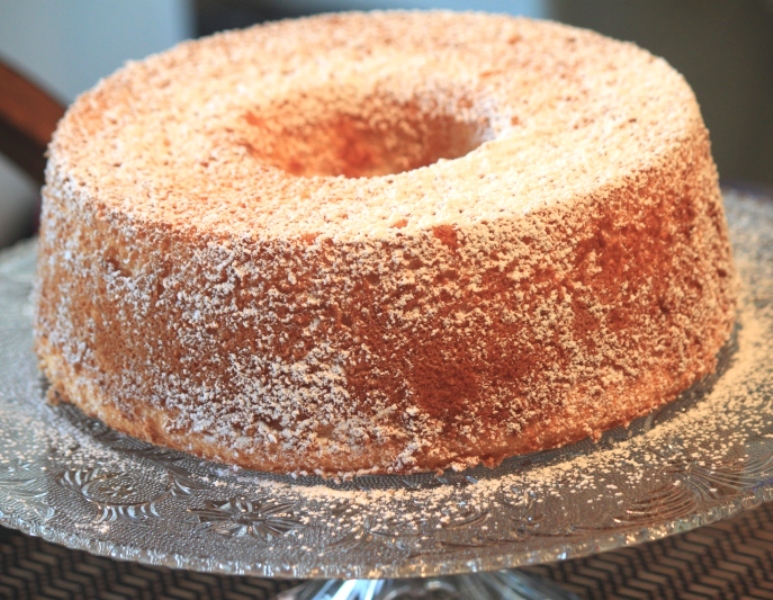 Angel Food Cake 2 | Rosetta Bakes! Angel Food Cake is so light and fluffy and so low in fat, that you’re able to enjoy all it’s goodness without the guilt. This cake has all the great flavor you want an Angel Food Cake to have. You can change this cake in several ways; by adding a few additional ingredients, you can change this recipe to be Cherry Angel Food Cake, Chocolate-Cherry Angel Food Cake, Chocolate Confetti Angel Food Cake, Espresso Angel Food Cake as well as Lemon Angel Food Cake. In other-words, you can make this cake yours! By adding assorted colored sprinkles into the batter, you can have a Confetti Angel Food Cake. I hope you enjoy this “guilt-free” cake soon… you won’t be disappointed. 1. Let egg whites stand at room temperature for 30 minutes. Room temperature egg whites will have more volume when beaten than cold egg whites Move oven rack to lowest position. Heat to 375 F.
2. In medium bowl, mix powdered sugar and flour; set aside. In large clean, dry bowl, beat egg whites and cream of tartar with electric mixer on medium speed until foamy. Beat in granulated sugar, 2 Tablespoons at a time, on high speed, adding vanilla, almond extract and salt with the last addition of sugar. Continue beating until stiff and glossy. Do not under-beat. 3. Sprinkle powdered sugar-flour mixture, 1/4 cup at a time over egg white mixture, folding in with a rubber spatula just until sugar-flour mixture disappears. Push batter into ungreased 10-inch angel food (tube) cake pan. Cut gently through batter with a metal spatula or knife to break air pockets. 4. Bake 30 to 50 minutes or until cracks feel dry and top springs back when touched lightly. Immediately turn pan upside down onto heatproof bottle or funnel. Let hang about 2 hours or until cake is completely cool. 5. Loosen sides of cake with knife or long metal spatula; remove from pan. Spread or drizzle chocolate glaze over top of cake. Gently fold 1/3 cup chopped, very well-drained maraschino cherries into batter in Step 3. Continue as directed. Stir 2 ounces grated semisweet baking chocolate into powdered sugar and flour in Step 2. Continue as directed. Stir in 2 Tablespoons instant espresso coffee powder or granules into powdered sugar and flour in Step 2. Continue as directed. Stir in 1 Tablespoon grated lemon extract and1 teaspoon lemon extract to powdered sugar and flour in Step 2. Recipe from Betty Crocker cookbook “The Big Book of Cakes.” 2013.